With the release of the 25.1.0 Support Library, there's a new entry in the family: the ExifInterface Support Library. With significant improvements introduced in Android 7.1 to the framework's ExifInterface, it only made sense to make those available to all API 9+ devices via the Support Library's ExifInterface. The basics are still the same: the ability to read and write Exif tags embedded within image files: now with 140 different attributes (almost 100 of them new to Android 7.1/this Support Library!) including information about the camera itself, the camera settings, orientation, and GPS coordinates. For Camera apps, the writing is probably the most important - writing attributes is still limited to JPEG image files. Now, normally you wouldn't need to use this during the actual camera capturing itself - you'd instead be calling the Camera2 API CaptureRequest.Builder.set() with JPEG_ORIENTATION, JPEG_GPS_LOCATION or the equivalents in the Camera1 Camera.Parameters. However, using ExifInterface allows you to make changes to the file after the fact (say, removing the location information on the user's request). For the rest of us though, reading those attributes is going to be our bread-and-butter; this is where we see the biggest improvements. Firstly, you can read Exif data from JPEG and raw images (specifically, DNG, CR2, NEF, NRW, ARW, RW2, ORF, PEF, SRW and RAF files). Under the hood, this was a major restructuring, removing all native dependencies and building an extensive test suite to ensure that everything actually works. For apps that receive images from other apps with a content:// URI (such as those sent by apps that target API 24 or higher), ExifInterface now works directly off of an InputStream; this allows you to easily extract Exif information directly out of content:// URIs you receive without having to create a temporary file. Note: ExifInterface will not work with remote InputStreams, such as those returned from a HttpURLConnection. It is strongly recommended to only use them with content:// or file:// URIs. For most attributes, you'd simply use the getAttributeInt(), getAttributeDouble(), or getAttribute() (for Strings) methods as appropriate. One of the most important attributes when it comes to displaying images is the image orientation, stored in the aptly-named TAG_ORIENTATION, which returns one of the ORIENTATION_ constants. To convert this to a rotation angle, you can post-process the value. There are some helper methods to extract values from specific Exif tags. For location data, the getLatLong() method gives you the latitude and longitude as floats and getAltitude() will give you the altitude in meters. Some images also embed a small thumbnail. You can check for its existence with hasThumbnail() and then extract the byte representation of the thumbnail with getThumbnail() - perfect to pass to BitmapFactory.decodeByteArray(). One thing that is important to understand with Exif data is that there are no required tags: each and every tag is optional - some services even specifically strip Exif data. Therefore throughout your code, you should always handle cases where there is no Exif data, either due to no data for a specific attribute or an image format that doesn't support Exif data at all (say, the ubiquitous PNGs or WebP images). With just a few clicks, you can publish an app to Google Play and access a global audience of more than 1 billion 30 days active users. Finding success in global markets means considering how each market differs, planning for high quality localization, and tailoring your activity to the local audience. 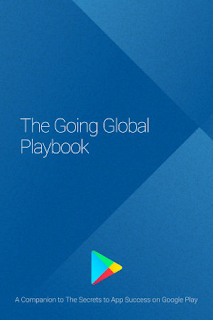 The new Going Global Playbook provides best practices and tips, with advice from developers who've successfully gone global. This guide includes advice to help you plan your approach to going global, prepare your app for new markets, take your app to market, and also include data and insights for key countries and other useful resources. This ebook joins others that we've recently published including The Building for Billions Playbook and The News Publisher Playbook. All of our ebooks are promoted in the Playbook for Developers app, which is where you can stay up to date with all the news and best practices you need to find success on Google Play. The Google Assistant brings together all of the technology and smarts we've been building for years, from the Knowledge Graph to Natural Language Processing. To be a truly successful Assistant, it should be able to connect users across the apps and services in their lives. This makes enabling an ecosystem where developers can bring diverse and unique services to users through the Google Assistant really important. In October, we previewed Actions on Google, the developer platform for the Google Assistant. Actions on Google further enhances the Assistant user experience by enabling you to bring your services to the Assistant. 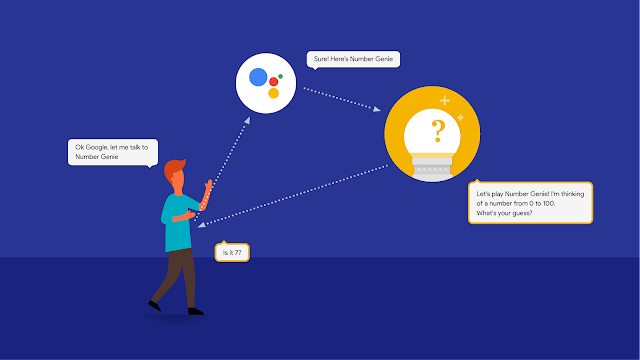 Starting today, you can build Conversation Actions for Google Home and request to become an early access partner for upcoming platform features. Conversation Actions let you engage your users to deliver information, services, and assistance. And the best part? It really is a conversation -- users won't need to enable a skill or install an app, they can just ask to talk to your action. For now, we've provided two developer samples of what's possible, just say "Ok Google, talk to Number Genie " or try "Ok Google, talk to Eliza' for the classic 1960s AI exercise. You can get started today by visiting the Actions on Google website for developers. To help create a smooth, straightforward development experience, we worked with a number of development partners, including conversational interaction development tools API.AI and Gupshup, analytics tools DashBot and VoiceLabs and consulting companies such as Assist, Notify.IO, Witlingo and Spoken Layer. We also created a collection of samples and voice user interface (VUI) resources or you can check out the integrations from our early access partners as they roll out over the coming weeks. Today is just the start, and we're excited to see what you build for the Google Assistant. We'll continue to add more platform capabilities over time, including the ability to make your integrations available across the various Assistant surfaces like Pixel phones and Google Allo. We'll also enable support for purchases and bookings as well as deeper Assistant integrations across verticals. Developers who are interested in creating actions using these upcoming features should register for our early access partner program and help shape the future of the platform. Build, explore and let us know what you think about Actions on Google! And to say in the loop, be sure to sign up for our newsletter, join our Google+ community, and use the “actions-on-google” tag on StackOverflow. Driving installs is important to growing a user base, but it's not much use if your app sits on users' devices and is rarely opened. In a competitive app landscape, it's increasingly important to engage and retain users over the long term to build a successful business. Users who are using your app more will have a higher lifetime value and be more likely to share your app. Watch my Playtime session below to hear about the tools and features other developers are using to increase app engagement. You can also read the summary of my main tips below. Building a high quality app is the foundation of a great user experience on Android. The better your app's user experience is, the more engaged your users will be. Optimizing for material design, for example, can significantly improve user engagement as well as building for Android Wear, Auto or TV where it makes sense based on your value proposition. To achieve high quality, we recommend you to check out the latest Android features, tips, and best practices in our Playbook for Developers. The developer of the golf app, Hole19, tailored their app's user experience thoughtfully for Android Wear and, as a result, saw a 40% increase in user engagement compared to non-Wear users. Watch a video about Hole19's success. Personalising your app experience to make users feel at home is a good way to start a long lasting relationship. Onboarding new users is a crucial step in this process. Onboarding should be fast and seamless and ask for minimal user input - after all users want to start using your app as quickly as possible. Furthermore, the onboarding should be a core part of the overall product experience. Use images and wording that's true to your brand and only ask for user input when it's actually needed, to reduce friction and avoid losing users. 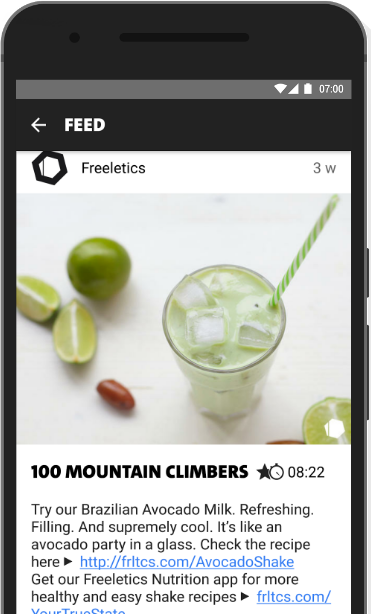 Freeletics, a fitness app, created an engaging user onboarding flow in which they tailored imagery and text to male and female users respectively. They also moved the registration process to a later stage in the funnel to reduce friction. The improved onboarding flow increased user activity by 58% within the first 7 days. They also implemented Google Smart Lock to seamlessly sign-in returning users. 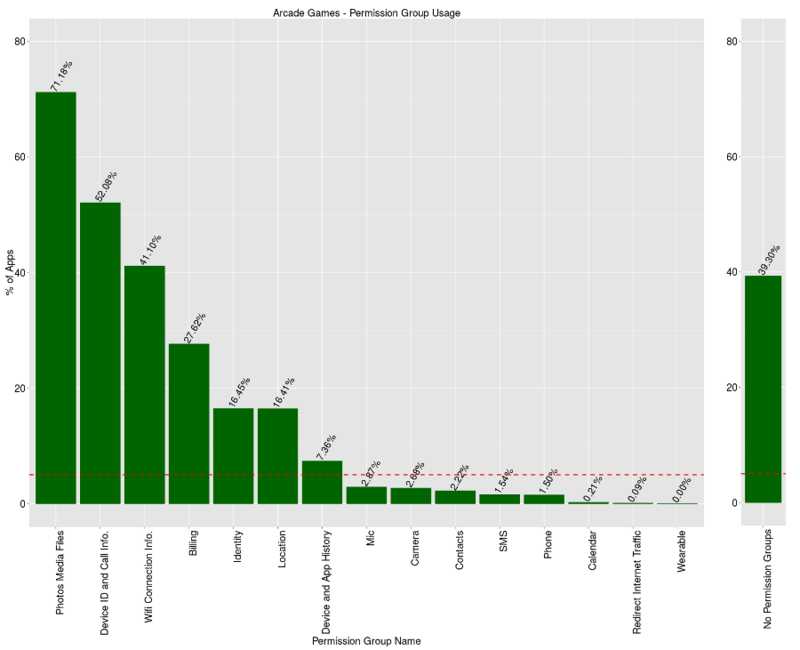 Define a clear objective for each release to measure your impact, e.g. increase number of users who edit a photo by at least 10%. Use beta testing to gather user feedback and iterate a feature before it's rolled out to all of your users. Enable the pre-launch report in the Play developer console to spot potential flaws and ensure technical stability in your alpha and beta apps. Guide users to each new feature as if it is a light onboarding experience. Visually highlight what's new and provide a short explanation why users should care. Measure performance with analytics to see if the new feature drives engagement (that you've defined as your objective). Be relevant and only send messages that matter to the user in context. Be creative and true to your brand, speak your users language and use an authentic tone. Make notifications actionable for your users and don't forget to deep link to content where applicable to save your users time. Remember that not all your users are equal so personalize your message to different user cohorts with Firebase Notifications. Consider timeliness of your messages to get users the right notification at the right time and with the right frequency. For example, it might be better to send a notification about something interesting to read at a time when the user normally gets out their phone – like during their commute – instead of the middle of the day, when they might be busy and dismiss a new notification. Finally, give users control over what notifications they receive so that they can opt-in and opt-out of the notifications they like and don't like respectively. If users get annoyed about certain types of notifications and don't have a way to disable them, they might uninstall your app. The Norwegian news app Aftenposten implemented a new onboarding flow that clarified which notifications were available, allowing readers to manage their preferences. This reduced uninstalls by 9.2.% over 60 days and led to a 28% decrease in the number of users muting notifications completely. Read more about Aftenposten's success. Giving sneak peeks of new features by inviting them to a beta group. Decorating user accounts with badges based on their behaviour. Offer app exclusive discounts or promo codes that can only be redeemed in your app. Generally, the more you can personalize the reward the better it will work. A great Android app gives developers a unique opportunity to create a lasting relationship with users and build a sustainable business with happy customers. Therefore optimising apps to engage and retain your users by following these 5 tips should be front and centre of your development goals and company strategy. Find more tips and best practices by watching the sessions at this year's Playtime events. Working at Google Play, we’re on the front line watching developers build, polish, and launch their dreams for millions of users to experience. While it’s exciting to be a part of so much creativity, we’re often asked how small startups can stand out in such a competitive field. We recently had Josh Elman & Sarah Tavel of Greylock Partners speak at our events, sharing their experiences working in Product Marketing and Engineering at major tech companies including Twitter, Facebook and Pinterest. Below are four tips to hit the ground running and create a business built for success. Every startup has an ultimate goal, but don’t forget to create micro-goals. Breaking your larger goal down into smaller milestones creates checkpoints to review progress and ensure momentum is heading in the right direction. This also allows for flexibility if teams need to course correct along the way, not to mention micro-accomplishments to celebrate! The first level in Sarah’s Hierarchy of Engagement is to identify the core action for users to perform in your app. Once you have engagement with this core action, level 2 is driving retention, getting users to come back and perform the core action more and more. The ultimate goal is to hook users with your app creating accruing benefits, whereby deeper and more frequent engagement creates habits and product dependencies. Example: For those looking to improve on organizational skills, Evernote can be a lifesaver. The more lists users create, the more they rely on the product. Evernote becomes such an ingrained habit that it naturally transcends between personal and professional worlds. When launching a new app, look for ways to achieve virality. Find hooks to make users fall in love with your app and strive to make it part of their regular habits. But watch out, not all types of virality are treated equally. “Whenever you’re thinking about engineering virality, you need to be sure that you’re reaching the right people, getting them interested for reasons that align with the intrinsic value of your product, and leading them to the right actions,” – Josh Elman, Partner at Greylock Example: Whether you’re lucky enough to convert happy users into product evangelists or catch fire through social media, outbreak virality has driven tremendous success for apps like Pokémon GO and Prisma. 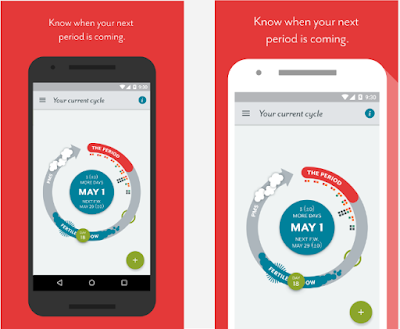 While monitoring traditional mobile metrics such as installs and DAUs provide a high level overview of app performance, cohort analysis is key to understanding user behavior and optimizing for growth. When rolling out changes in your app, make sure to track cohorts for an extended duration. Initial results may tell one story at D7, but hold tight, as things could turn a corner by D15 or even later. Give users time to adapt and get comfortable with the changes before making any final product decisions. Read more tips on how to find success for your app or game start up in the Playbook for Developers app. We're constantly working on ways to make Google Play a great place for users to discover apps and games they'll love. We know this is crucial to most developers ongoing success. There are steps you can take to ensure your app is primed for success – that's why we're sharing a reminder of some of our top tips for getting your app discovered on Google Play. First, build for quality. Android users expect high-quality apps. App quality directly influences the long-term success of your app - in terms of installs, user rating and reviews, engagement, and user retention. These are some of the factors that go into our search and discovery systems that help discern what apps to recommend and surface across our Google Play experiences. When building your app, check against the quality criteria, and use what you need from the material design guidelines to make sure you are delivering a highly usable experience. Also, be sure to test your app for functional quality. Opt-in to the pre-launch report for your alpha and beta apps in the Google Play Developer Console and you'll receive a report for each APK showing how it performs on real devices. This will help you identify crashes and other issues before you release your app. Example: Designing for high usability through Google Material Design. Second, be considerate on which permission settings to enable for your app. We see that there are some apps that ask for very sensitive permissions, even when the app doesn't use them. (For example, a camera app asking for read and write permissions to call logs.) Excessive app permissions may dissuade users from installing your app. In fact, one study, in which users were shown two unbranded apps with similar ratings that had the same functionality but different sets of permission requests, showed that users were, on average, 3 times more likely to install the app with fewer permissions requests. And a similar study showed that users are 1.7 times more likely, on average, to select the application with fewer permission requests. The rule of thumb is to enable permissions that are only essential to your app. Read the best practices for app permissions. Chart: Distribution of permission groups use across Arcade Games category.If you're building an arcade game, you many only need a very few permission settings, if any. Lastly, be attentive to user feedback. It's ultimately the users who drive our search and discovery systems. When you hear user feedback about bugs or other issues, we recommend engaging with the feedback and, if needed, updating your app in a timely manner. Having an up-to-date app that reflects your user's feedback can help you gain more installs, engagement, and higher ratings. Beta testing is a good way to get feedback from real users before launch. 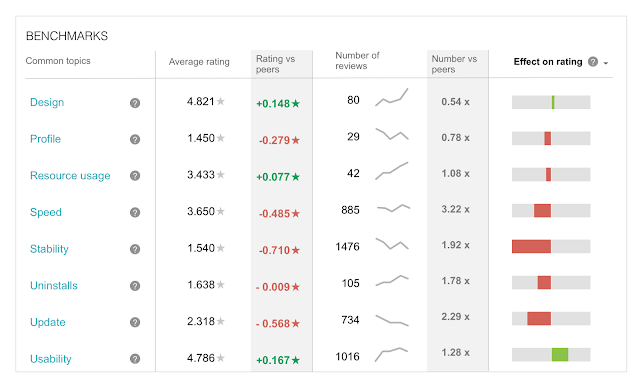 You can also check the ratings and reviews section of the Developer Console to see an analysis of what users are saying about your app and how that is affecting your rating compared to similar apps. 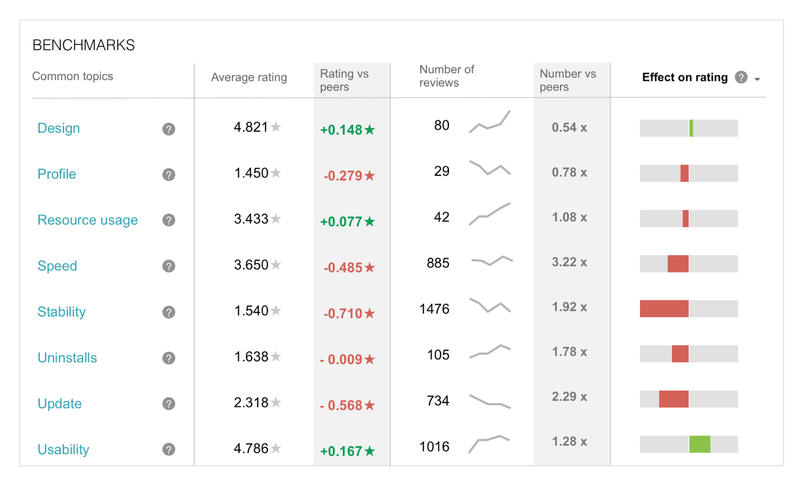 Review benchmarks in the Developer Console uses machine learning to give you insights about what users are saying about your app and how it affects your rating. Google Play strives to help users find and discover the most safe, high quality, useful, and relevant apps. 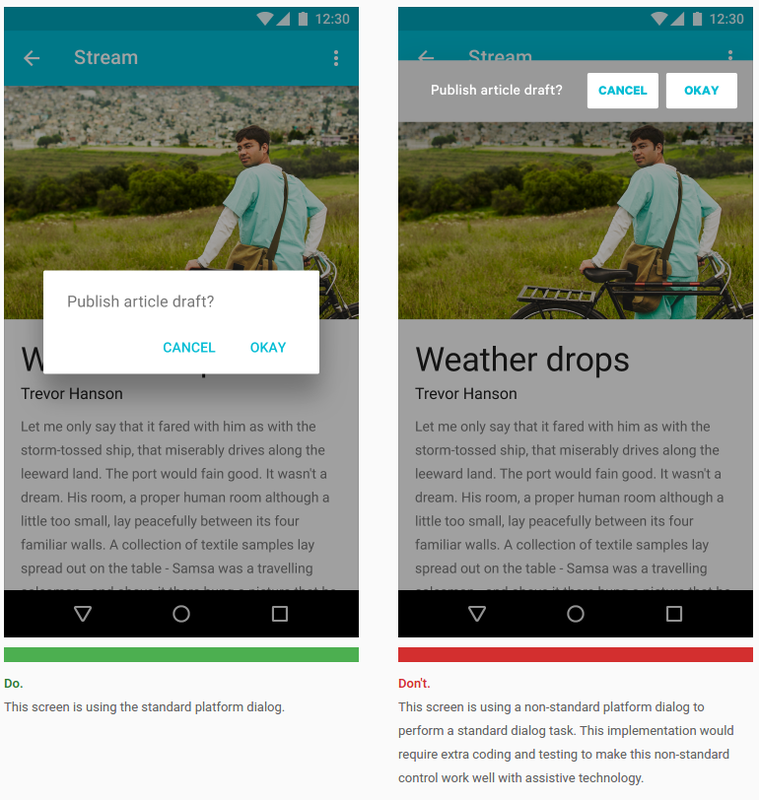 Building apps that put user's interest first will help you be successful in Google Play. For more tips and best practices for building a successful app business on Google Play, get the Playbook for Developers app. We're making a Developer Preview available today and plan to release additional updates in the coming months. Please send us your feedback by filing bugs or posting in our Android Wear Developers community. Apps that require direct interaction with the paired mobile device - some experiences require Android Wear to connect directly to a paired phone. 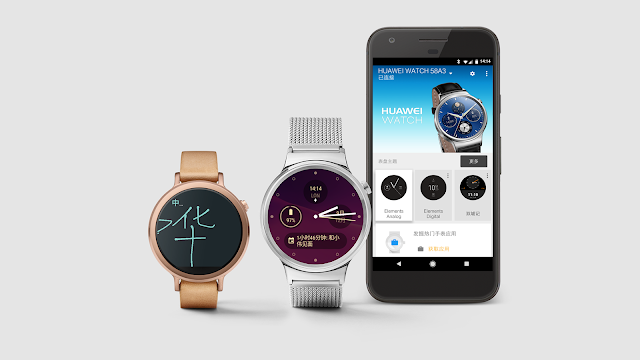 In this case, the Data Layer API introduced in Android Wear 1.0 will continue to function. New FusedLocationProvider for China - we have added location detection to the SDK for Chinese developers. With the user's permission, your app can receive location updates via the FusedLocationProvider. The Internet of Things (IoT) will bring computing to a whole new range of devices. Today we're announcing two important updates to our IoT developer platform to make it faster and easier for you to create these smart, connected products. We're releasing a Developer Preview of Android Things, a comprehensive way to build IoT products with the power of Android, one of the world's most supported operating systems. Now any Android developer can quickly build a smart device using Android APIs and Google services, while staying highly secure with updates direct from Google. We incorporated the feedback from Project Brillo to include familiar tools such as Android Studio, the Android Software Development Kit (SDK), Google Play Services, and Google Cloud Platform. And in the coming months, we will provide Developer Preview updates to bring you the infrastructure for securely pushing regular OS patches, security fixes, and your own updates, as well as built-in Weave connectivity and more. There are several turnkey hardware solutions available for you to get started building real products with Android Things today, including Intel Edison, NXP Pico, and Raspberry Pi 3. You can easily scale to large production runs with custom designs of these solutions, while continuing to use the same Board Support Package (BSP) from Google. We are also updating the Weave platform to make it easier for all types of devices to connect to the cloud and interact with services like the Google Assistant. Device makers like Philips Hue and Samsung SmartThings already use Weave, and several others like Belkin WeMo, LiFX, Honeywell, Wink, TP-Link, and First Alert are implementing it. Weave provides all the cloud infrastructure, so that developers can focus on building their products without investing in cloud services. Weave also includes a Device SDK for supported microcontrollers and a management console. The Weave Device SDK currently supports schemas for light bulbs, smart plugs and switches, and thermostats. In the coming months we will be adding support for additional device types, custom schemas/traits, and a mobile application API for Android and iOS. Finally, we're also working towards merging Weave and Nest Weave to enable all classes of devices to connect with each other in a secure and reliable way. So whether you started with Google Weave or Nest Weave, there is a path forward in the ecosystem. This is just the beginning of the IoT ecosystem we want to build with you. To get started, check out Google's IoT developer site, or go directly to the Android Things, Weave, and Google Cloud Platform sites for documentation and code samples. You can also join Google's IoT Developers Community on Google+ to get the latest updates and share and discuss ideas with other developers. List out the tactics you're using to achieve each objective and keep track of their performance. You can visualize it using a scorecard like in the example below created by Mobile Growth Stack. Built a continuous flow of global and localised store listing experiments. Monitored changes in the user acquisition performance report for target countries and channels. Gathered insights from what users are saying from the reviews analysis. Tactic: Viral growth. Virality is a core growth tool for apps and games that focus on sharing and usually the mechanic is built into the core user experience of the product. However, even if sharing isn't a key component of your app, you can still influence two key variables to create an appropriate environment to encourage virality. Decrease your "cycle time", how long it takes between inviting a user and that user sending out the next round of invitations to their friends. Offer more incentives for users to share the app or its content while they're using it will help shorten the cycle time and kickstart viral growth! Results: 96% of new Nutrition app sales generated by users who originally registered for the developer's Bodyweight training app. Surface meal advice in the Bodyweight app's activity feed with the goal of raising awareness for the approaching launch of their new Freeletics Nutrition app. It's important to track your tactics against real metrics to measure your impact. That will help you make decisions about where to increase or decrease your efforts. Your priorities will also change based on the evolution of your business and product lifecycle as well as due to external factors such as new techniques becoming available, so be open to regularly adjusting your tactics. Get more tips and best practices in the sessions from this year's Playtime events.